I don’t usually do this, but could not help myself with these two extraordinary fish. Below are pictures of Chet Work (top picture) and Mark Davidson (bottom picture) with two behemoth browns. I have fished with both of these gentlemen and can say that they are diehard fishermen. Chet is now the Executive Director of the Teton Regional Land Trust, but formerly worked for The Nature Conservancy. Mark Davidson used to be the Manager of the Nature Conservancy’s Silver Creek Preserve in Picabo, Idaho, but now works out of The Nature Conservancy’s Hailey, Idaho office. With their strong conservation ethic, I can’t think of two folks more deserving of these two huge fish of a lifetime. These two browns were caught on separate evenings in the same general area of an undisclosed popular fishery. 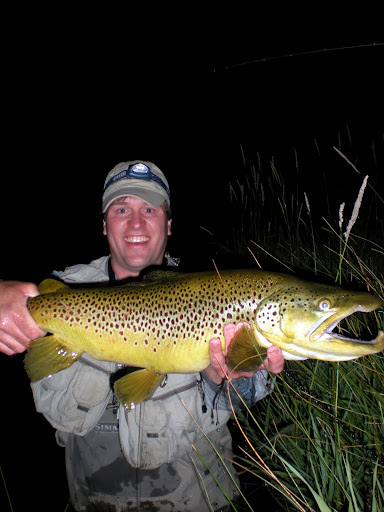 As you can tell by the pictures, Chet and Mark were both fishing in late at night. They were both using floating mouse patterns. Mark personally informed me that he was fishing in an area that already had been worked over so he did not have much hope for a bite. To his surprise, by the light of the moon, Mark saw a huge, great-white mouth engulf his fly. His companion saw it too and exclaimed, “Holy Cow!! !” (or something to that effect). Fortunately, Mark had on 25 pound test tippet and it held. Mark said that holding the fish felt like he was holding a salmon. Undoubtedly, this is the fish of a lifetime. 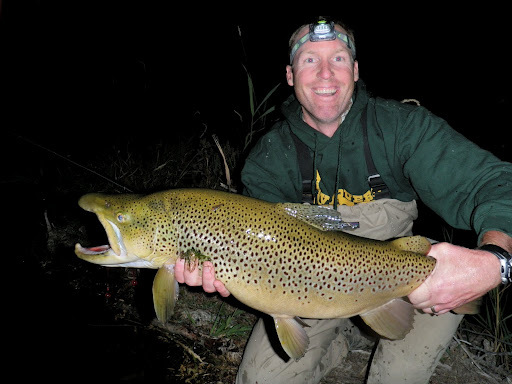 Heck, both Mark and Chet’s browns are fish of a lifetime. Congratulations to both of you! All I have to ask is: When are you taking me? Previous Post >Gone Grousing Colorado Style…Stay Tuned! Very nice Browns, but do we have a weight? What Dale said. Holy cow!! !